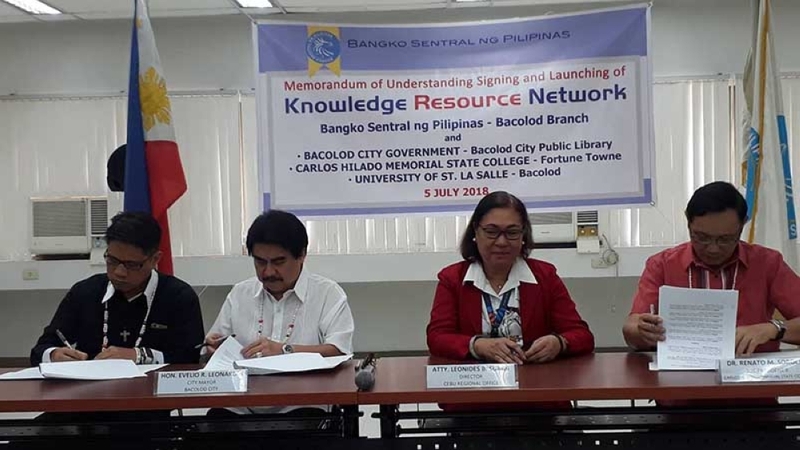 IN ITS bid to strengthen economic and financial literacy among Negrenses, the Bangko Sentral ng Pilipinas (BSP) has partnered with the Local Government of Bacolod and two institutions in the city for the establishment of its Knowledge Resource Network (KRN). BSP Cebu Regional Office Director Leonides Sumbi signed yesterday, July 5, the memorandum of understanding (MOU) with partners such as the City Government of Bacolod for its public library, University of Saint La Salle–Bacolod, and Carlos Hilado Memorial State College (CHMSC)–Fortune Towne. The MOU signing held simultaneously with the program launching at BSP–Bacolod Branch was also attended by Mayor Evelio Leonardia and officials of the recipient private university and state college. Sumbi, who covers Western Visayas, Central Visayas and Eastern Visayas, said enhancing the public’s economic and financial literacy is actually the goal of the BSP. However, through its public information campaigns, they found out that only a few knew about the Central Bank. This is something which the KRN is trying to address as this will provide basic things, especially about the BSP, which people on the street would like to know, Sumbi said. “It is BSP’s vision to make Filipinos better informed and empowered with reliable and up-to-date sources of information so that they can make better economic and financial decisions,” she added. The KRN aims to establish a facility for information and knowledge sharing, a key element supporting the National Strategy for Financial Inclusion. It is also positioned to make BSP's information materials easily discoverable in its partners' library systems and available for use by their clients. Likewise, the network supports the economic and financial learning objectives of the BSP and promoting greater transparency in its operations. Currently, the BSP has 23 libraries, one each in its three regional offices in La Union, Cebu and Davao. Its 19 branches nationwide, including that in Bacolod City, also have one library each. The other one, the biggest library, is at the Economic and Financial Learning Center (EFLC) at BSP Head Office in Metro Manila. In terms of KRN, the agency has already 139 networks all over the country including the new ones in Bacolod City. Under the partnership, institutions are providing space in their respective libraries for information materials featuring articles on the role of the BSP in the country's economy, financial consumer protection, and identification of the security features of the Philippine peso. Others are weekly wealth watch, selected economic and financial indicators, and copies of the bank's official magazine. Users can also access online resources through an application provided in every KRN. Partner libraries may also connect with BSP's official website (www.bsp.gov.ph) and access online publications, journals, and references on economics, banking, finance, investment and other related topics. Sumbi said the city library, since it is for public use, can cater not only to the academe like students and teachers but also to clients who have already graduated but with no access to resources. She added in the private schools and state universities and colleges (SUCs), on the other hand, their main recipients are mainly students especially when the information has something to do with their lessons on economics, finance, inflation, statistics, and mathematics, among others. "Through KRN, people who need information need not go to the BSP to access our data thus, they save time and resources," she said, adding that "we intended to establish more networks in the country." Leonardia, for his part, said the program is timely and relevant as there is a need to strengthen financial literacy in the city. For Brother Joaquin Severino Martinez, president and chancellor of USLS–Bacolod, information is now the real wealth. Finances, economy and the people are working together to improve other people’s lives. CHMSC president Dr. Renato Sorolla, meanwhile, said the library is the heart of all educational institutions. It’s a source of materials that help students comply with their academic requirements. “We are happy to be part of this endeavor,” he said.